Nicknamed the "heart of India" due to its geographical location in the central part of country, Madhya Pradesh (MP) is the second largest state by area spread over 3,08,245 sq. km of vast fertile land. With over 75 million people, it is the sixth largest state in India by population. It borders the states of Uttar Pradesh to the north-east, Chhattisgarh to the south-east, Maharashtra to the south, Gujarat to the west, and Rajasthan to the northwest. The region covered by the present-day MP includes the area of the ancient Avanti mahajanapada, whose capital Ujjain (aka Avanti) emerged as a major city during the second wave of Indian urbanisation in the 6th century BCE. Subsequently, the region was ruled by the major and minor dynasties of India: Gurjar pratihara, Mauryans, Gupta Empire, Harshavardhana, Rajput kings of Paramara, Chandelas, Bundela and Tomaras. Finally, the Mughals established their firm control over this vast region. Following which Marathas were able to push back the Muslim invaders to extend their supremacy to areas in and around Avanti mahajanapada. By the early 18th century, the region was divided into several small kingdoms which were captured by the British and incorporated into Central Provinces, Berar and the Central India Agency. Ujjain arose as a major centre in the second wave of Indian urbanisation in the 6th century BCE, and served as the chief city of the kingdom of Malwa or Avanti. Further east, the kingdom of Chedi was part of Bundelkhand region. Chandragupta Maurya united northern India (1,500 BCE) thus setting up his Mauryan Empire (1,500-185 BCE) which included all of modern-day Madhya Pradesh. King Ashoka's wife was said to come from Vidisha, a town north of present day Bhopal. The Maurya Empire went into decline after the death of Ashoka. After this, Central India became hotly contested among the Sakas, Kushanas, and local dynasties during the 3-1 centuries BCE. Ujjain emerged as the commercial hub of western India from the 1st century BCE, located on the trade routes between the Ganges plain and India's Arabian Sea ports. It was also an important Hindu and Buddhist centre. The Satavahana dynasty of the northern Deccan and the Saka dynasty of the Western Satraps fought for the control of MP during the 1-3 centuries CE. The south Indian king Gautamiputra Satakarni of the Satavahana dynasty defeated the Saka rulers and conquered parts of Malwa and Gujarat in the 2nd century CE. 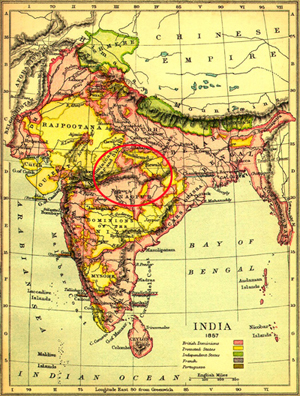 Northern India was conquered by the Gupta Empire in the 4-5th centuries, which was India's "classical age". The attacks of the Hephthalites or White Huns (Central Asian nomads known as Sveta Huna in Sanskrit) brought about the collapse of the Gupta Empire, and India broke up into smaller states. King Yasodharman of Malwa defeated the Huns in 528 CE ending their expansion. King Harsha of Thanesar reunited northern India for a few decades before his death in 647 CE. Malwa was ruled by the South Indian Rashtrakuta Dynasty from the late 8th century to the 10th century. The Medieval period saw the rise of the Rajput clans, including the Paramaras of Malwa and the Chandelas of Bundelkhand. The Paramara king Bhoj (1010-1060) was a brilliant polymath and prolific writer. The Chandelas created the temple city of Khajuraho between 950 and 1050. Gond kingdoms emerged in Gondwana and Mahakoshal. Northern MP was conquered by the Turkic Delhi Sultanate in the 13th century. After the collapse of the Delhi Sultanate at the end of the 14th century, small regional kingdoms re-emerged, including the Tomara Rajput kingdom of Gwalior and the Muslim Sultanate of Malwa with its capital at Mandu. The Malwa Sultanate was conquered by the Sultanate of Gujarat in 1531. Madhya Pradesh came under Mughal rule during the reign of the emperor Akbar (1556-1605). Gondwana and Mahakoshal remained under the control of Gond kings who extended their loyalty to the Mughals and hence, enjoyed virtual autonomy. After the death of the Emperor Aurangzeb in 1707, the Mughal dynasty began to weaken. Marathas began to expand from their base from central Maharashtra. Between 1720 and 1760 the Marathas took control of most of MP. Maratha clans ruled semi-autonomous states under the nominal control of the Maratha Peshwa. The Holkars of Indore ruled Malwa; the Bhonsles of Nagpur dominated Mahakoshal, Gondwana as well as Vidarbha in Maharashtra; and Jhansi was founded by a Maratha general. Bhopal was ruled by a Muslim dynasty descended from the Afghan General Dost Mohammed Khan. However, the Maratha expansion was checked at the Third Battle of Panipat in 1761. The East India Company were expanding their Indian dominions from bases in Bengal, Bombay, and Madras. Three Anglo-Maratha Wars were fought between 1775 and 1818. The Third Anglo-Maratha War was decisive and made the British supreme in India. Most of MP including the large areas of Indore, Bhopal, Nagpur, Rewa, and dozens of smaller chiefdoms became the princely states of British India. The Mahakoshal region became a British province called the Saugor and Nerbudda Territories. In 1853 the British annexed the state of Nagpur which at that time included south-eastern Madhya Pradesh, eastern Maharashtra and most of Chhattisgarh. All these areas were combined with the Saugor and Nerbudda Territories to form the Central Provinces in 1861. The princely states of northern Madhya Pradesh were governed by the Central India Agency. Madhya Pradesh was created in 1950 by clubbing together the former British Central Provinces, Berar and the princely states of Makrai and Chhattisgarh with Nagpur as the capital of the state. The new states of Madhya Bharat, Vindhya Pradesh and Bhopal were formed out of the Central India Agency. In 1956 during the process of states reorganisation based on linguistic affinities in India, the states of Madhya Bharat, Vindhya Pradesh, and Bhopal were merged into Madhya Pradesh. While the Marathi-speaking southern region Vidarbha, which included Nagpur, was ceded to Bombay state. Bhopal became the new capital of the restructured central state of Madhya Pradesh. In November 2000, as part of the Madhya Pradesh Reorganisation Act, the south-eastern portion of the state split off to form the new state of Chhattisgarh.